This is the Board of Directors of SEMA, the Specialty Equipment Market Association. SEMA is a marketing group whose purpose is to promote and market automotive companies. Founded in 1963 by parts manufacturers, SEMA now consists of over 6,466 companies in the $31 billion automotive aftermarket industry. SEMA's mission statement is "to help our members' businesses succeed and prosper". Every year, SEMA puts on the SEMA Show in Las Vegas, Nevada. The SEMA Show is both the biggest automotive show of the year, and the single largest event on the Las Vegas calendar. 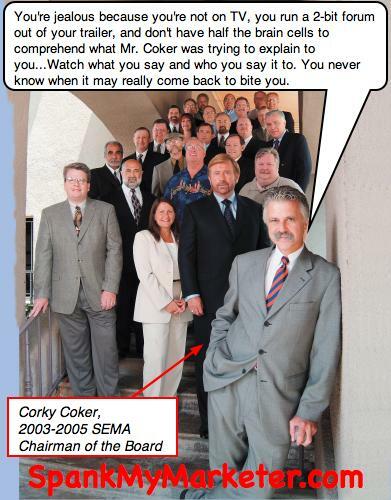 In this 2004 photo, Corky Coker, president of Coker Tire, is standing in front of the group, as Chairman of the Board of SEMA. 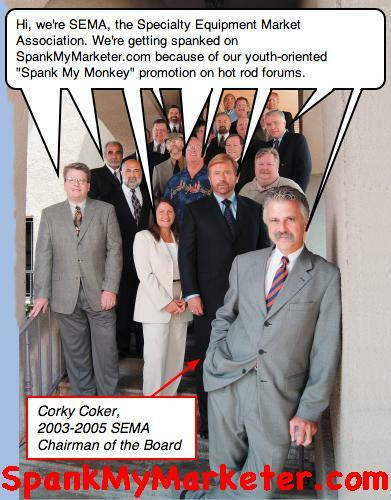 Coker served on the SEMA Board of Directors for 12 years, and led SEMA as the Chairman of the Board from 2003-2005. Coker also founded the Automotive Restoration Market Organization (ARMO), a subdivision of SEMA. To make parody comics of SEMA, check out The SpankMaker. This strategy was most likely an attempt to use the upcoming SEMA Show to market to what SEMA refers to as the "rat rod" culture. In a September 2006 press release, SEMA identified "rat rods" as a lucrative "emerging youth culture trend", along with "donks" and "drifting". Automotive marketers were encouraged to attend the upcoming SEMA Show where they could "see up close and in depth what's next for this lucrative market, and get everything you need to take advantage of it." SEMA's focus on the rat rod market would later be confirmed by a November 2006 article in The New York Times: Wax Is Waning at Vegas Show That Sets Trends. "Then there's the rat rod -- a veritable Franken-car, a junkyard medley of stripped-down power. The gloves are off with these anti-street rods, just like the bells and whistles. Every non-essential part is gone. The roofline and suspension are chopped. Upholstery is home-made, paint job, primer gray. Big money goes into these rides, but all of it's under the hood -- if there is a hood, that is." When the Spank My Monkey thong photograph and the Anti-Christ of the Hot Rod World video were posted on the forums of the Hotrodders Bulletin Board, the appalled forum members immediately took action. They began to warn other forums, through The Crankshaft Coalition. Then, they researched the failed promotion, and contacted those who were responsible. Hotrodders.com appealed to SEMA. SEMA refused to speak with Hotrodders.com, instead dispatching their public relations firm, Freeman/McCue Public Relations, to deal with the fiasco. The situation was directly handled by Dan McCue, president of Freeman/McCue Public Relations. McCue refused to offer an explanation for the Spank My Monkey/Anti-Christ campaign, or for Coker Tire's underhanded and deceptive tactics. No claim of responsibility was made, and no apologies were offered. SEMA's official response through the public relations firm was only 12 words long. SEMA said: "SEMA has no plan for a car giveaway at the SEMA Show". 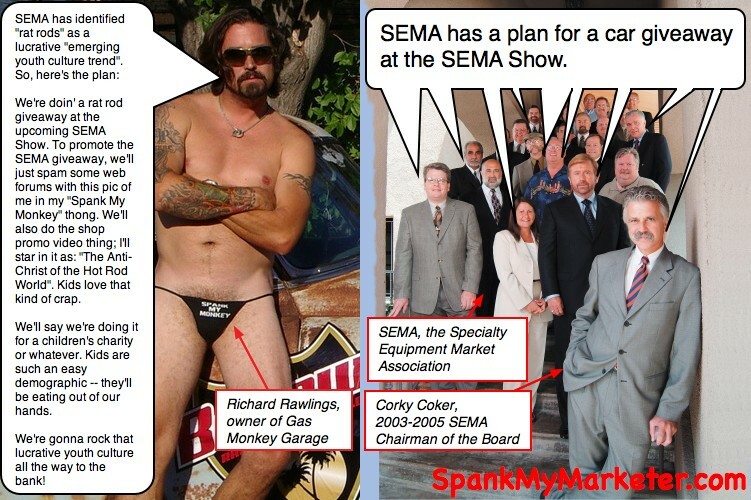 To make your own parody comics of SEMA or Richard Rawlings, check out The SpankMaker. The Spank My Monkey marketing campaign was widely rejected. However, there was one hot rod forum on which the promotion was initially very successful. When the Spank My Monkey campaign was first launched, members of the Youngrodderz Forum adamantly supported it. As the Spank My Monkey campaign was first being investigated, they rushed to its defense. When it came under fire in the online hotrodding community, Youngrodderz Forum members encouraged each other to immediately register on other hotrodding forums and post their support for the Spank My Monkey promotion. In response to the investigation of the marketing campaign, one of the Youngrodderz members said: "I don't see anything wrong with doing something for charity. I thought that was a good thing? Or are they just freakin' out cause they hate 'rat rods'?" When the seamy underbelly of the marketing campaign was fully exposed, the Youngrodderz members quickly changed sides. A Youngrodderz Forum administrator would even post a public apology over their initial misunderstanding of the Spank My Monkey campaign. The Youngrodderz Forum is described as: "A discussion forum for younger (under age 20) hot rod enthusiasts". SEMA would probably describe them as: "A lucrative emerging youth rat rod market". If you think what SEMA did was inappropriate, you can contact them on the phone at (909) 396-0289, or by email at sema@sema.org. You can also contact the companies that you support in the hotrodding industry, and let them know about SpankMyMarketer.com. They will probably be furious to discover that SEMA is targeting youth hot rod markets with an Internet marketing campaign that includes men posing in women's thong underwear imprinted with the slogan "Spank My Monkey, and a video in which the owner of a well-known hot rod shop declares that he is "The Anti-Christ of the Hot Rod World". Or, you can make your own SEMA parody comics with SpankMyMarketer.com's comic-making tool: The SpankMaker. SEMA News Bureau (April 12, 2006). Industry Celebrates American Muscle at the 40th Annual SEMA Show. Press release. Retrieved Dec. 17, 2006 from http://www.semashow.com/main/main.aspx?id=70157. SEMA Mission Statement. SEMA.org. Retrieved Dec. 17, 2006 from http://www.sema.org/Main/SemaOrgHome.aspx?ID=50486. SEMA. Wikipedia.org. Retrieved Dec. 17, 2006 from http://en.wikipedia.org/wiki/SEMA. Coker, Corky (Aug. 1, 2006). SEMA Council Summit and Hall of Fame. Coker.com. Retrieved Dec. 17, 2006 from http://blog.coker.com/index.php/2006/08/01/sema-council-summit-and-hall-of-fame/. Catullo, Jason. Follow the Leaders. SEMA.org. Retrieved Dec. 17, 2006 from http://www.sema.org/main/semaorghome.aspx?id=55717. Hotrodders.com (Aug. 28, 2006). Gas Monkey Garage is giving away a Hot Rod -- need your help. Hotrodders Bulletin Board. Retrieved Dec. 17, 2006 from http://www.hotrodders.com/forum/gas-monkey-garage-giving-away-hot-rod-need-your-help-96191-12.html#post682929. Hotrodders.com (Sep. 6, 2006). update on Gas Monkey Garage scandal. Hotrodders Bulletin Board. Retrieved Dec. 17, 2006 from http://www.hotrodders.com/forum/update-gas-monkey-garage-scandal-97414.html#post687882. Youngrodderz (August 25, 2006). gas monkey garage is giving away a free hot rod. Youngrodderz. Retrieved Dec. 17, 2006 from http://z15.invisionfree.com/youngrodderz/index.php?showtopic=938. regarding YoungRodderz and GMCkid. Hotrodders Bulletin Board. Retrieved Dec. 17, 2006 from http://hotrodders.com/forum/regarding-youngrodderz-gmckid-96624-3.html#post684338. Rod and Custom Category. Open Directory Project. Retrieved Dec. 17, 2006 from http://dmoz.org/Recreation/Autos/Enthusiasts/Customized_Cars/Rod_and_Custom/.